Day 48: The Chimera That Wasn’t. Day +48. Just got the results from the most recent chimerism test of my cells (T, B, and neutrophils) and the percentage donor cells dropped from 42% overall to 5% overall. Not a good thing. This helps explain why my cell counts have been slowly dropping over the past two weeks, in addition to some of the drugs I’m taking which are known to lower counts. By the way, my counts have been steadily dropping over the past two weeks. Nothing is in the critically dangerous range, thankfully, but they have been trending downward. The plan moving forward is to stop all immunosuppressants (the drugs Tacrolimus and CellCept) and weekly monitor the chimerism status in hopes of getting the donor cells to grow since we’re removing the “brakes” that are the immunosuppressants. Worst case scenario if my counts continue to drop and the donor cells don’t pick up is we’ll ask my donor for a hematopoietic stem cell donation and I’ll get a stem cell transfusion. The expectation is that the stem cells with help supplement the marrow transplant, differentiating into the appropriate sub-cell types and aiding in the repopulation of immune cells. The stem cell infusion is outpatient and fairly similar to getting a blood transfusion, e.g. being hooked up to a pump and receiving the goods, so non-invasive and painless. I’m not worried at all. I have complete faith that my donor cells will pick up and I’ll start to rebuild a functioning immune system. Until then, I’m still holding tight and trying to recover as quickly as possible while maintaining my sanity. On the upside, my RBCs and hemoglobin are steadily increasing! Which is fantastic. And I’m gaining more energy as the weeks pass. Which is wonderful. – I churned out another vocal arrangement for Resound of Mumford and Son’s Below My Feet. I’m really happy with how it turned out and I’m super excited to hear it come together. – I’m working out a few donut recipes! Cake donuts, yeast donuts, different flavor combos, the works. This is part of a potential business venture a friend of mine and I are considering embarking upon. More details and pictures to come. – Home errands. Now that I’m gaining more energy and mental faculties, I’m finally able to do all those little home projects I’ve always wanted to do. So far I’m rearranged my room, cleaned my closet (a major feat), and sorted through a bunch of things in my “junk” box…es. Spring cleaning never felt so good! – Working through a brain puzzle book my friends Dan and Logan T. got for me. Gotta work on those brain muscles as much as my body ones! Verbal, visual, numerical, and logical puzzles galore. I love tickling my brain and having to think again. Day +39. My counts are all about the same as last week. Discouraging? Slightly. Concerning? Not so much. The results from the chimerism tests came back, and I’m roughly 42% donor (meaning I’m still 58% Min), which is on the low side for this many days post-transplant. I should be around 50%. To help the new marrow grow more, they’ve lowered the daily dosage for one of the immunosuppresants I’ve been taking (CellCept) by a third and will redo the chimerism test late next week to see if it helps boost the presence of donor cells in my body. Worst case scenario: if my own cells over take the donor’s cells, I get a stem cell transplant from the same donor to help boost the number of donor cells. I knew I was healthy and robust, but geez body, calm it down! You need to let the donor cells take over and do their thing. Seriously. Like I said last week, I’ve been gaining more and more energy which has been pretty great! I’m finding that I’m able to do more things I used to do, within reason. I still look forward to my afternoon naps, but they’re becoming more of a luxury than a necessity. My body aches and headaches have subsided quite a bit and my mind isn’t as foggy as it used to be. I’m really looking forward to being able to read books again! Finally. To a degree, I can say that I do. I know waaay more about “adult things” like insurance, taxes, liabilities, and finances than I did five years ago. But I can’t honestly say I have a clear idea of what I want to do with the rest of my life. That’s not to say I don’t have any idea of what I want. I know that I want to get married, have a family, and eventually retire having lived a happy, fulfilled life surrounded by people I love and who love me. I know that I want the work I do, whether my career or hobbies, to have a positive impact on others. I know that I want to spread love and positivity, and foster inclusivity and acceptance wherever I go. I’m celebrating my birthday fairly low key this year. The day has restful and productive — chores and errands. Tonight, a few friends are coming over for bbq dinner and dessert from one of my favorite bakeries, Tartine! Pictures to come. Day +32. My counts from my appointment yesterday are all in the normal range except for my red blood cells and lymphocytes. So insane! I don’t know how they climbed so quickly! Neutrophils, white blood cells, platelets, all in the normal range. The RBCs usually take a while to get back to normal, but each week they are increasing slowly. The lymphocytes (T cells, B cells, NK cells) will take a while to come back too as I rebuild immunity to everyday antigens or pathogens. The CMV viral load is about half of what it was last week, which means the meds are working well. I imagine I’ll be out of the “dangerous” range later this week. But I’ll have to continue on the antiviral meds for another 4 weeks just to make sure it doesn’t come back guns a-blazing. I still have the annoying congestion but the cough is better and the mucus is thinner and less abundant. Yay for getting better! I’ve slowly been regaining energy as well! I try to make a goal to walk to a different spot in the city (and back), to different parks, cafes, etc, just to break up my routine and sort of feel normal again. Sometimes in life, you’re disappointed by people you most rely on. Sometimes your own family members are the ones who disappoint you. Sadly, this is the case for me. For reasons I’d rather not discuss here, my dad decided to leave to go back to Texas. I spoke with my NP asking if I really need a 24/7 dedicated caregiver since I’m self-administering meds, can make my own food, and can take cabs to my appointments (since I still can’t take public transit). For him, he thought it was okay but he would have to get the okay from the care team before giving an absolute green light. Until then, my friend Graham has graciously offered to be my temporary caregiver helping where he can and where I need any assistance. But let’s be real, I’m more than self-sufficient to be able to take care of myself. I’ve said this time and time again, but when life gives you lemons, squeeze out the juice, mix in some gin, simple syrup, and champagne, and enjoy yourself a nice French 75! Day +27. My counts are all slowly on the rise! Woot! Oh, happy day. (OH HAPPY DAY). If we keep this up, I’ll be recovered to normal levels in no time! It’s amazing how much better life is when you stop trying to jump from the bottom to the top of a mountain, and instead take steps along the side. Less bruises and cuts, and much less failure. Reaching my tangible, daily goals has really helped boosted my esteem and overall happiness incredibly. Such a simple solution to bothersome problem. Today I completed a 16-page arrangement of Everybody Knows by John Legend for seven voices for Resound Ensemble, the group I sing with in SF. I love this song and have always wanted to arrange it. I’m very happy with how it’s turned out and can’t wait to see it performed! 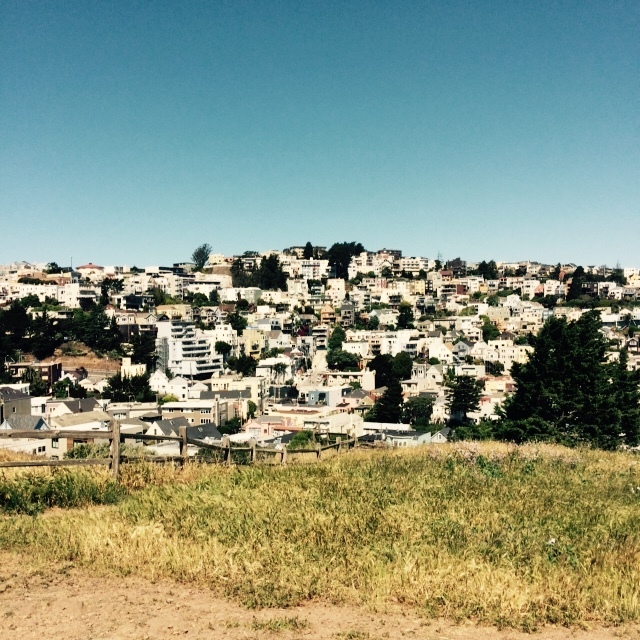 A snapshot from the top of Kite Hill in my neighborhood from my walk this afternoon. I love this city! Day +26. I found out today that, based on my blood work from yesterday, I tested in the positive range for cytomegalovirus (CMV) infection. CMV is a virus similar to Epstein-Barr virus (EBV) that causes infectious mononucleosis (mono), with similar symptoms. Prior to the transplant, I had CMV immunity (I got it from somewhere?). My donor however didn’t, so the marrow I received was CMV- for immunity. Often times in situations like these (being immunocompromised), the CMV can get reactivated and can cause a lot of complications, which is why they test very carefully for it. Thankfully, they caught it before it got too out of hand and my NP swapped the antiviral medication I was taking to one that’s more specific for CMV — valganciclovir (aka Valcyte). April 1st. The day of fools. For me, it was a day of starting fresh, starting new. I was tired of feeling sluggish, out of shape, and trapped at home so I’ve resolved to walking 5,000 steps a day (thanks for keeping track Fitbit! ), following The 30 Days of Yoga with Adriene for… 30 days (shocker), and making small, tangible, daily goals that I can accomplish to fill my days (e.g. organize my closet, make birthday cards, clean my room, baking something, read a book, etc). I think my approach to this whole period of recovery was wrong from the start. I was definitely trying to the tackle the whole mountain at once instead of making small, daily progress. Basically, I was setting myself up for failure over and over again, which is why I found myself so frustrated, upset, and defeated. So, I’m “pressing the reset button” and taking the approach I should have had from the beginning. Small, achievable steps towards the top of the mountain every single day. It’s going to be a long, bumpy road, with hiccups and mishaps along the way, but there’s only one way up and I’m determined to get there even if I have to fight tooth and nail for it. Lucky I have great hiking gear. Day +25. At my appointment yesterday we found out my counts are dropping, except for the platelets which are oddly increasing. My neutrophils were low so I got a shot of Neupogen, and my hemoglobin is trending downward — I might need a transfusion in the near to distant future if it doesn’t pick up. All of this isn’t out of the ordinary and isn’t a cause for alarm. They should all begin to start picking up soon though. I hope. This helps explain why I’ve been increasingly tired and fairly irritable as of late, hence why I haven’t been writing much. If you don’t have something nice to say… That and nothing interesting has been happening other than me sleeping a ton, gaining weight (which all the nurses say is a good thing? but I’m irritated by it), and going from show to show aimlessly, mindlessly binge watching things, which I believe is a big source of frustration since I feel like I’m wasting my time. One of my dearest friends Monique told me that you have the option to press reset every morning when you wake up, and you can reset your attitude to a positive one. I am a firm believer of that ideology, except it’s only after I’ve had some Tylenol and oxycodone that I can even begin to reach for that reset button. Good days and bad days. My current daily battle. Will today be a good day? What determines if a day is good? Is there something inherent about the day itself that determines it’s goodness or badness? My mood? My pain level? My bowel movements? Level of productivity? With what moral lens am I examining these days to determine their goodness factor? I suppose at the end of the day it’s all subjective, right? So that means a subjectively bad day can be as subjectively good, no? Which means that this concept of good vs. bad days isn’t an absolute. Thus on my bad days, I’m equally having a good day if I allow myself to see it that way, and vice versa. Food for thought. This is my second week out of the hospital and things are going pretty well with my dad taking care of me. We had a really good story time sesh today where he basically told me his whole life story — something I’ve been waiting my whole life to hear! (Twenty six years is a long time to wait, dad. Geez.) My dad’s a man of few words, so he doesn’t say anything that isn’t necessary. To hear his version of his plight and more importantly his reflections on life was a real treat and really gave me a lot of perspective in one of my darkest hours. Be strong and persevere.